Last year, I said the total data storage market would stay flat despite big growth in unstructured data. I’d have to say that seems to be true, if not actually dropping. Despite lots of new entrants in the market, the average vendor margin in storage is narrowing with software-defined variants showing up everywhere, open-source alternatives nibbling at the edges, commodity-based appliances becoming the rule, and ever-cheaper “usable” flash products improving performance and density at the same time. 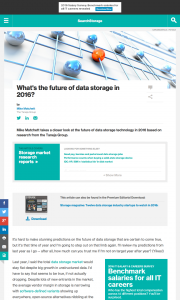 This entry was posted in Published Articles and tagged Predictions, SearchStorage, Storage magazine, Taneja Group by Mike. Bookmark the permalink.